← Winter Bark, Leaves and Twigs. In a Vase on Monday. January Jewels. The winter is beginning to bite and it is going to get colder. But that doesn’t mean that there are no flowers to enjoy in the garden. 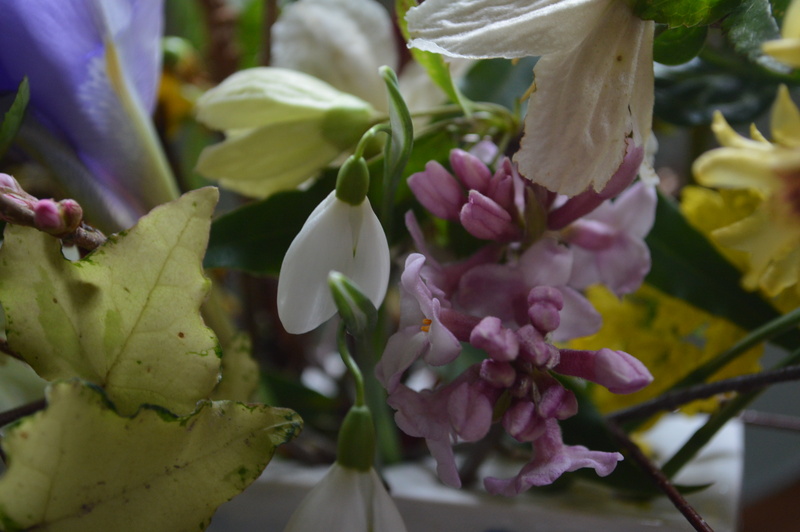 January blooms are like jewels and they are very often fragrant too. 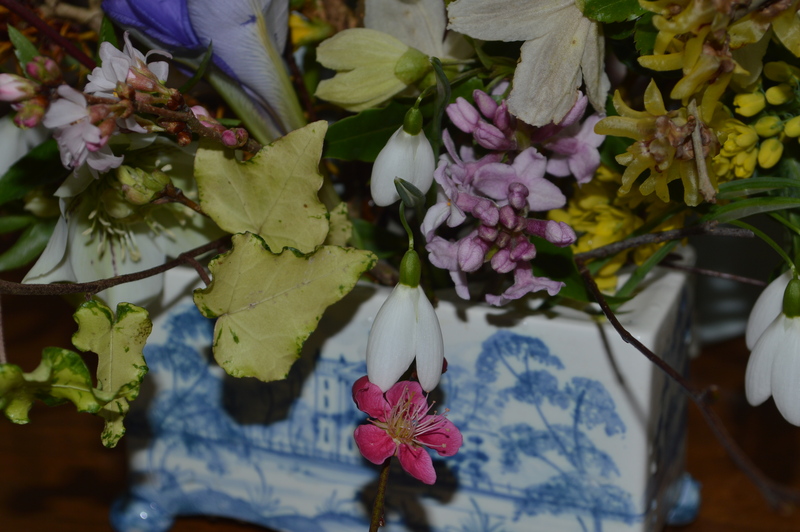 I picked some of my favourites and here they are spilling out of their jewel box . Let’s look at the fragrant ones first. 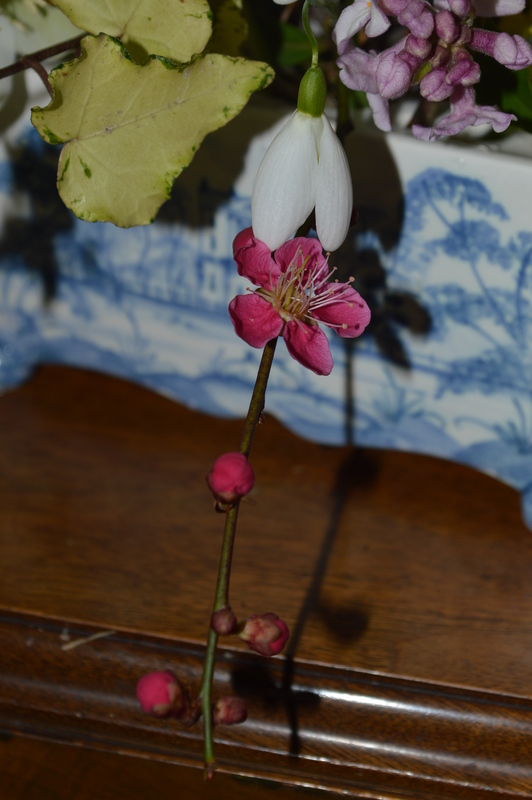 Chimonanthus praecox is incredibly sweet and spicey. But the sweetest of all has to be Daphne bholua ‘Jacqueline Postill’. This is the queen of the January garden. The dark pink blossom is the first bloom on my Japanese Apricot, Prunus mume ‘Beni-chidori’ and its dark pink flowers are sweetly fragrant too but not as intensely as the daphne. The little tufts of Sarcocca hookeriana var. humilis are strongly fragrant and have a musky perfume. The witch hazels which we love to grow because they come in such an amazing range of colours are crosses between the Japanese Hamamelis japonica and the Chinese Hamamelis mollis which is strongly fragrant. The resultant Hamamelis x media hybrids are only faintly fragrant and some of them don’t smell at all. At any rate it is difficult to discern any scent outside. But if you bring them inside then they have a lovely subtle sweet scent. This one is ‘Jelena’. More scent comes from the winter honeysuckle, Lonicera purpusii ‘Winter Beauty’ and a late spray of Mahonia x media ‘Winter Sun’. Lonicera x media ‘Winter Beauty’ on left. Mahonia x media ‘Winter Beauty’ on right. 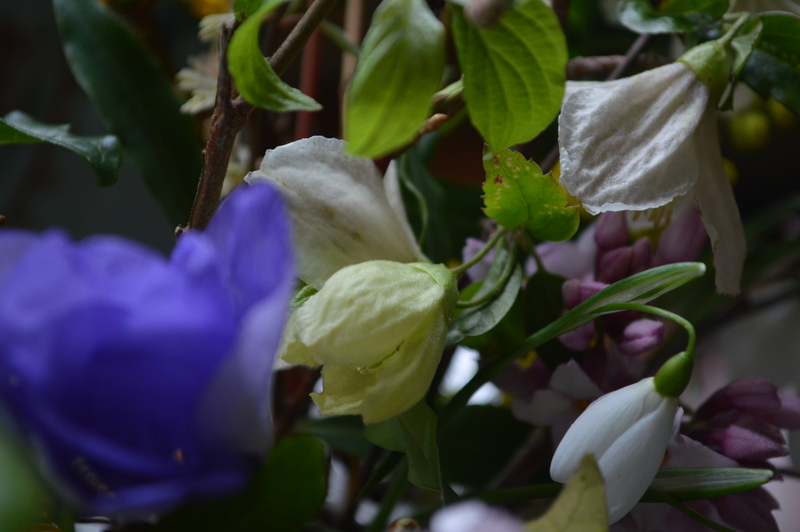 I only just noticed that the little bells of Clematis cirrhosa var. balearica ‘Wisley Cream’ are fragrant too. The snowdrops are Galanthus ‘S. Arnott’. 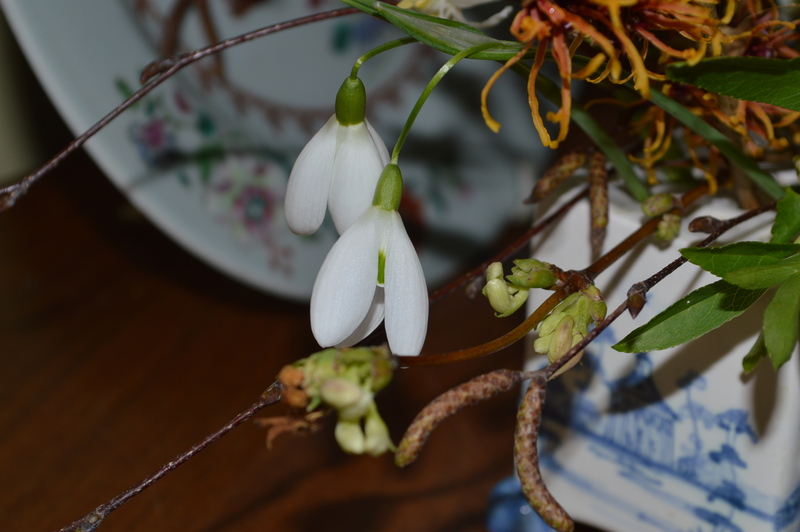 This snowdrop has a light fragrance when you bring it into the house. Many snowdrops do in fact smell sweet but I think this is one of the best for scent. If you pick Iris unguicularis in bud you can almost watch it unfurl in the warmth and it has a light fragrance too. The little bit of pink blossom peeping out of the bottom of the above picture is Prunus subhirtella ‘Autumnalis Rosea’. It will go on blooming until the spring unless we get a really cold spell and then it will have a rest and carry on when the weather gets milder again. I can’t discern any fragrance but it is very pretty and dainty. To set off all these jewels I have used catkins from the hedgerow hazel, sprigs of red and orange dogwood and the weeping birch Betula pendula. 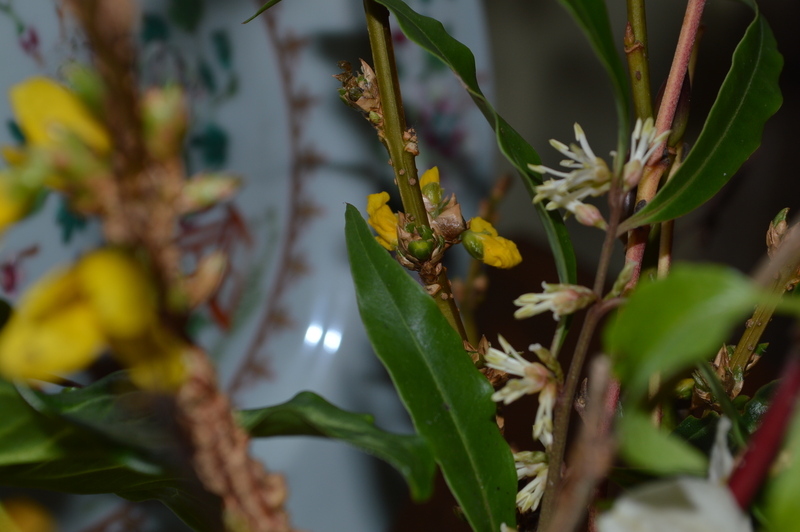 There are some sprigs of forsythia I picked last week, and for foliage there is the marbled leaf Arum italicum sub. ‘Marmoratum’and a yellow leaved ivy. The ‘jewel box’ is a flower brick which I bought at Highgrove when I went to have lunch with HRH years ago. OK, to be honest it was not just the two of us tête-à-tête. He invited all the County Organisers of the National Gardens Scheme and their partners for lunch, so there were a lot of us there. But I still boast about it and show everyone the photograph. And I remember the occasion every time I get my flower brick out. 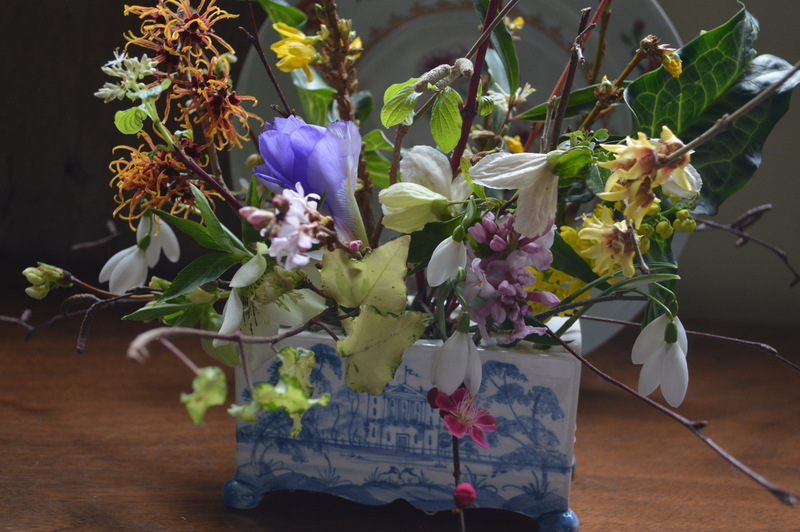 Thank you Cathy at Rambling in the Garden for encouraging us to prowl round our gardens whatever the weather to find something lovely to put in a Vase on Monday. 41 Responses to In a Vase on Monday. January Jewels. As an American, which HRH did you lunch with? You really have lots of winter flowers. Prince Charles. Highgrove belongs to him and he has created a wonderful garden there. I thought it might be him as I knew he was a gardener. Such abundance, I’m deeply envious. So much so I think a trip to my local nursery to buy more winter flowering shrubs might be the order of the day!!! Joking aside, your vase of sweetly perfumed blooms is a joy to behold. Thank you Christina. 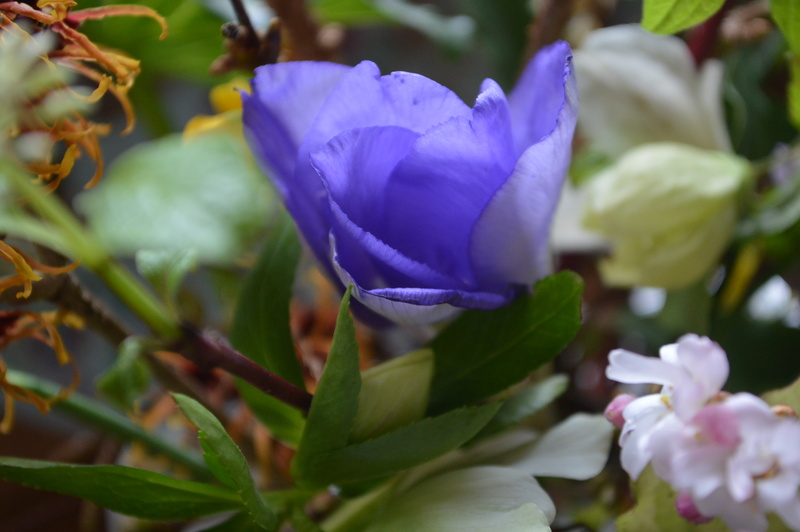 If you only get one new plant, I recommend Daphne bhloua ‘Jacqueline Postill’, it is absolutely fabulous. I know but I’ve never seen it for sale here. Wow! I have never heard of the Japanese flowering apricot outside of the Santa Clara Valley! I thought we had a monopoly on it. It is rare even here. There is a pair of them in the old Municipal Rose Garden in San Jose. They are quite old and tired. I happen to like them because they are not the common purple leaf plum. Flowering cherries are of course somewhat popular here; although not too common. Prunus mume is quite rare here too. I have two, a white and a pink. They are quite tricky and need a sheltered spot to do well. Why do they need shelter? A gem of a memory to go with your winter jewels. 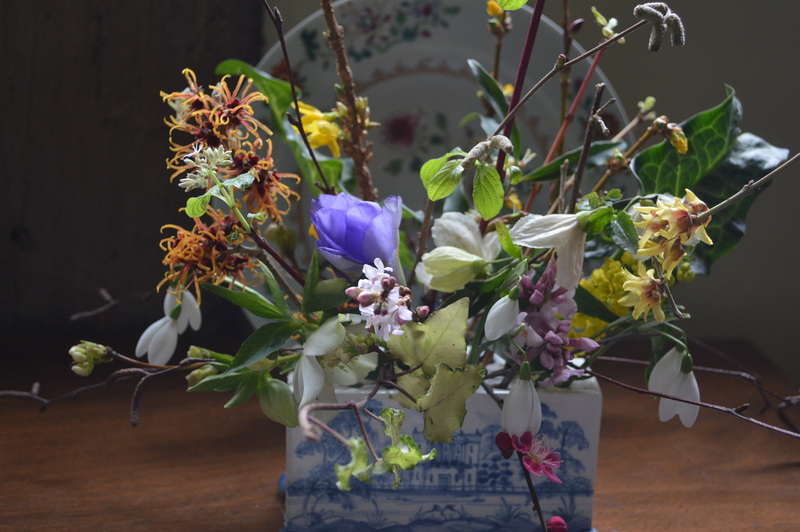 I love your floral brick and it’s contents so beautifully arranged, an exuberant ode to winter’s charms. Thank you Peter. A flower brick is great for displaying flowers as it has holes and you can spread the flowers out nicely instead if bunging them all in together. Utterly beautiful, Chloris. The lighting on your photos is so beautiful. I love all the details you have focused on. Thank you Ali, that is praise coming from you. I only wish I had your skill with the camera. Jewels indeed – all your smelly Preciouses in one old brick, well a gorgeous brick with right royal connections. Absolutely exquisite, Chloris. Do you think you ight open for the NGS agan some day? Visiting Highgrove is on my wish list. Thank you Cathy. I opened my old garden for the NGS for 8 years but I don’t think I want to do it again. I do village openings and have groups round but as you know NGS open days are a lot of work. All those cakes and plants to grow for the plant stall. A real collection of January Gems…love the flower brick. I saw a couple on a windowsill at a National Trust property. Now that I know what they are called, it will make looking for one easier I hope. Thank you Noelle. Flower bricks are quite expensive but I think flowers look lovely in them and they are so easy to arrange. You have some wonderful winter blooms. I only wish we could pick up the smell of this post! Can I grow the Daphne bholua Jacqueline Postill in a container? I’d love one near the front door, but no planting spots there. Thank you Jude. I have Jaccqueline Postill by the front door and people knock on the door to ask what it is. I have never tried growing daphne in a pot but I think you could if you have a nice big pot and a loam compost with plenty of grit. And of course it mustn’t dry out. Fat chance of anything drying out here! I love your brick from HRH! Thank you Dorris. The scents of the winter garden are wonderful. You have really worked hard at winter flowers and scent. I have a few but, having only been here three years, I have way to go. You have made me think that this might be a good time for a visit to my local nursery to pick out a few more… Very pretty and looking good in the Jewel box courtesy of HRH. I am imagining the scents. Thank you. Yes, now is a good time to be thinking about buying plants for winter interest, specially if you are looking for Witch Hazels, it’s a good idea to choose them when they are in flower. What a variety! 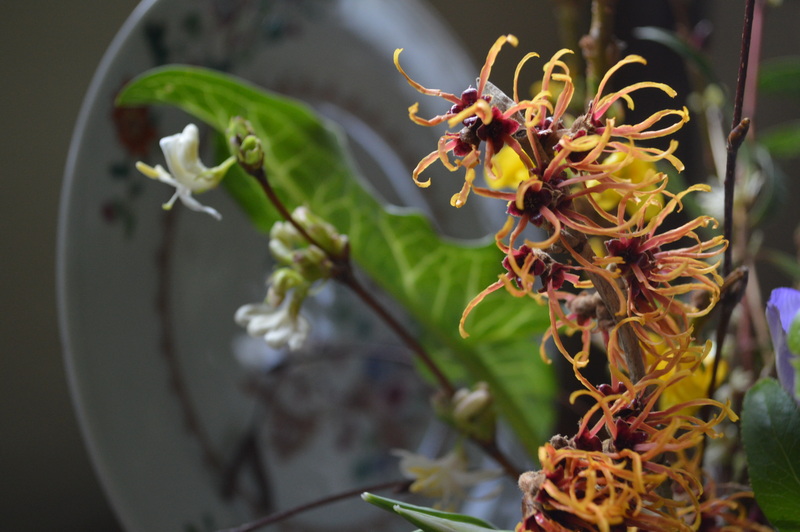 I’m most jealous of the witch-hazel, which I couldn’t help imagining combined with my Grevilleas. However, your post also got me thinking about Daphnes. I had one for a time in my old garden, which did well enough there (pre-drought) until I made the mistake to moving it. There’s only one species that will tolerate my climate (D. odora) but it might be worth trying in a pot as I know I’d enjoy the scent. 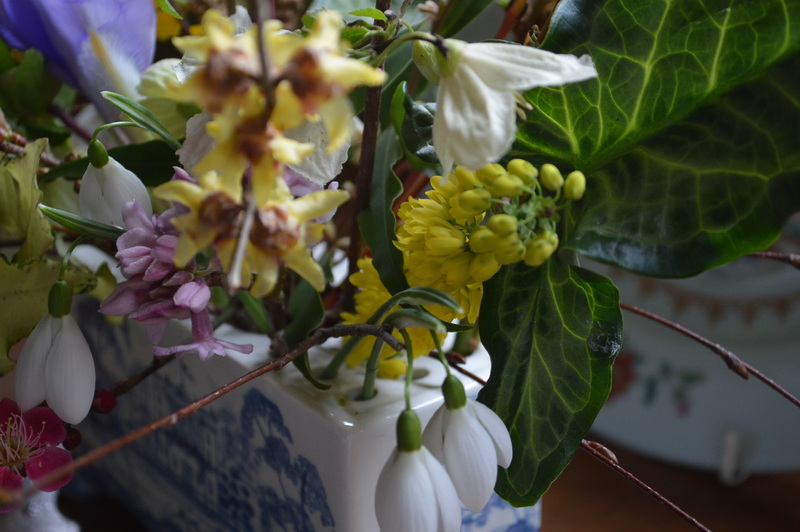 I love the Jewel-box vase – and its back-story – too. Thank you Kris. You have your own native Hamamelis virginiana don’t you? It’s not seen over here much because the hybrids of Hamamelis x intermedia come in such amazing colours and bloom in the middle of winter. Daphne odora is lovely but not as floriferous as Daphne bholua, is it not available over there? Such beauty and variety of shapes, colours and scents ! I only have holey yellow freckled hellebores and a few pulmonaria buds… Your jewel box is something else ! Thank you Frog. I find the earlier Helleborus niger always seems to get nibbled by slugs but Helleborus x hybridus has longer stems and the flowers don’t get mud splattered or chewed. Highgrove is amazing isn’t it? I particularly love the stumpery. Oh….loved this, until……ARGH…noooo..surely you two are not perpetuating the feudal/class system, supporting the royal family, hate to call them that…..they are German, but who cares, leeches, all of them! Oh my goodness, have you been talking to the Pianist? He’s a Republican too, what is it with you Scousers? I didn’t take him to Highgrove, it was husband number one who came and he is German too. Glad you like the vase. Lovely, wish I could get a whiff of that floral brick. Actually, I decided I want one the more photos I looked at. 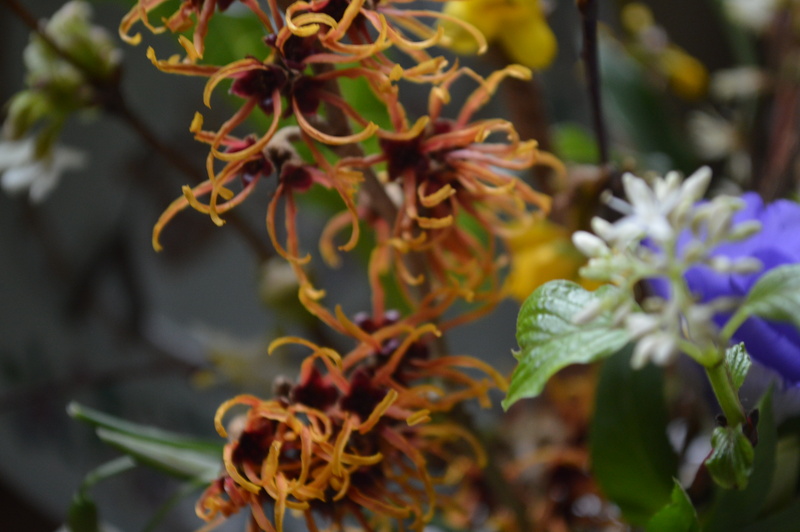 Chiomanthus is one of my favorites for winter flowers and I just used a Harvest Moon Witch Hazel in a garden, have you seen that one? 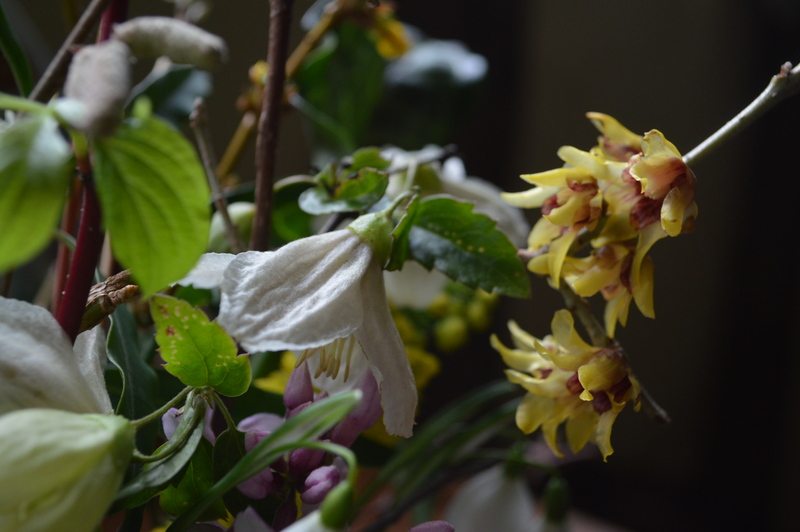 The chimonanthus is still going strong and looking wonderful. No, I haven’t seen Harvest Moon, you rarely see Hamamelis virginiana over here. A lovely little jewel box collection, Chloris. A treat for the eyes, and I expect, the nose. The brick looks v. pretty and really is filled with treasures. I am always envious when people have enough witch hazel and daphne to cut! I am sorry that I am only imagining the lovely scents. The flowers of ‘Jelena’ are much more beautiful than those of our native American Witch Hazel. Too bad about the lost fragrance, but at least you can enjoy the fragrance inside.